Roughly a year ago I bout myself a Down Low Glow, from Rock The Bike and have been using it on my commute every day since. I can't say I'm getting any more room on the road from Tokyo drivers than I did in the past, but in the event of a future accident I'll be able to yell at the driver "Which of my fifty #&'%! million flashing #&'%! lights did you fail to #&'%! see?!!?" I expected a few more comments and bigger reactions to the Down Low Glow than I've received to date. I've received my share of looks from pedestrians, drivers and cyclists alike, but only children grace it with a comment, usually along the lines of "Coooool! ", or "Woah, green!". Adults on the other hand don't like to show their surprise. By acting surprised at the Down Low Glow they're publicly admitting to all around they've never seen such a thing before. They dread the person they're with saying "Oh that, that was last weeks trend, I can't believe you didn't know about that!" Also about the same time I purchased my green Down Low Glow, those tiny single green LED strap anywhere lights suddenly became popular. Every time I rode past a cyclist sporting one of those I could see them shrivel up in DLG envy, yet everyone is too proud to ask where I got it. Oh well, its a hit with the kids. One in particular loves the DLG, my daughter. She has a pretty standard Japanese girls bike, step through frame, rack on the back and a translucent blue plastic basket on the front. Because of the unusual curve of her frame there is nowhere to conveniently mount the DLG, but toss the Down Low Glow into her front basket an suddenly she is cycling with a huge cube of green light on the front of her bike that absolutely nobody can fail to see. To date she hasn't expressed an interest in getting a DLG of her own, just don't tell her they're available in pink, purple, red, blue and amber as well as green! 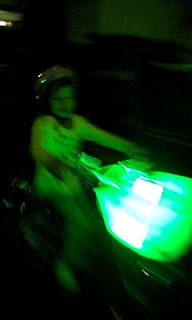 If you're in Japan and would like to get your hands on a Down Low Glow you can order from the Rock the Bike homepage. They deliver internationally and offer exceptional customer service. You'll also experience no problems using the American made charger with the Japanese power supply. I hope to see more Down Low Glows on the the streets of Tokyo real soon.